Push-rim wheelchair racers and handcyclists are familiar on the courses of D.C.-area races, but that’s not the case elsewhere in the country. For as long as Army Capt. Kelly Elmlinger can remember, running has been a part of her life and of her family’s. Three years ago, the competitive runner was vying for a Boston qualifying time — and missed it by mere minutes. It was a blow, but she was young and certainly would have another shot. Just a few months later, in March 2013, Elmlinger learned she had synovial sarcoma, a rare soft-tissue tumor, in her lower left leg. While she avoided amputation, the nine surgeries that followed left her without function in her leg. It was difficult to walk, let alone continue to run competitively. After three deployments to Iraq and Afghanistan, she began caring for wounded warriors as a nurse on the orthopedic unit at Brooke Army Medical Center in San Antonio, and knew her competitive life was not over. While her cancer diagnosis was devastating, getting back on the road and track as a push rim athlete was bittersweet. In a short time, she’s become an accomplished wheelchair athlete, earning gold medals in the 100m and 400m women’s wheelchair races at the 2014 Invictus Games in London. And she won four silver medals as the only woman to compete in last year’s Warrior Games held at Marine Corps Base Quantico in Quantico, Va. Earlier this year, the fierce competitor set her eyes on a second shot at qualifying for Boston. Elmlinger qualified by more than 10 minutes after her third-place finish in the women’s push rim division at the 2015 LA Marathon — her first in a wheelchair. This fall, she traveled to D.C. from her home in San Antonio to compete in the 2015 Army Ten-Miler’s push rim division. “I wish other people could experience what I’ve been able to,” Elmlinger said, adding that she considers herself lucky to live in a community that has a strong Paralympic and adaptive sports scene. Still, it’s often difficult to find races that will allow her to participate. That’s why she comes to Washington. At races across the D.C. area, wheeled athletes — both push-rim wheelchair racers and handcyclists — are a common sight. 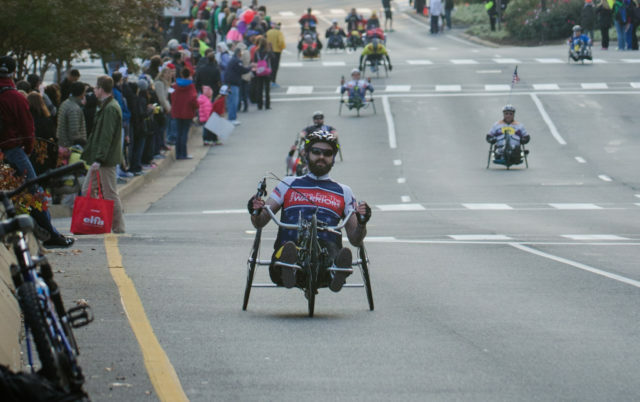 For roughly 20 years, two of Washington’s biggest races, the Marine Corps Marathon (MCM) and the Army Ten-Miler (ATM), have welcomed wheeled athletes with open arms. But elsewhere across the country, these competitive athletes have fought to be included in the local race scene. Tami Faram, public relations coordinator for the Marine Corps Marathon, explained that because handcycles have gears and brakes, they’re considered bicycles and fall under the jurisdiction of USA Cycling — so many marathons don’t allow them. In fact, USA Track & Field (USATF) sanctions only allow for a push rim division “provided the wheelchair (push rim) race is done as a separate division or course from the running event,” according to USA TF spokeswoman Jill Geer. Handcycles aren’t even allowed. Logistically, wheeled divisions require additional planning, something not all race organizers seem to want to do. For starters, handcycles are much faster than push rim wheelchairs and in some cases blaze through the course so quickly that they easily can outrun street closures — a huge liability. A recent case against the Missoula Marathon in Montana found reasonable cause that race organizers discriminated against a quadriplegic participant by limiting the number of wheeled athletes to just eight, imposing speed limits and instructing them to yield to runners, among other offenses. But some more progressive race organizers are changing this thinking, going the extra mile to allow for all wheelchair athletes — regardless of their mode of transportation — to participate. “With so many wounded veterans from all branches of the U.S. Armed Forces taking up the sport, the MCM allows the wheeled division, which includes both handcyclists and push rim, to continue to participate in ‘The People’s Marathon,’” Faram said. According to the U.S. Department of Veterans Affairs, there are approximately 4 million “service-connected” disabled veterans living in the U.S., meaning that their disability was a result of “disease or injury incurred or aggravated during active military service.” And while the veteran population has been declining for the last 30 years, advances in medicine have meant that more wounded veterans are able to survive their injuries; therefore, there’s been a rise in disabled veterans. For many of these vets, endurance sports like running help them with rehabilitation and regaining the confidence they had before their life-altering injuries. Organizations like D.C.-based Paralyzed Veterans of America have been advocating for more races to allow wheeled athletes to compete. Elmlinger believes there’s a “big movement” to shed more light on the issue, especially for disabled vets, and she applauds the military for helping advance the cause. Army Ten-Miler race director Jim Vandak was surprised to hear there are races that don’t allow these divisions. During his 19-year tenure with the event, wheeled athletes have always been included. Marine Corps Marathon and the Rock ‘n’ Roll D.C. Marathon as a push rim athlete.